Hello fellow Knitalong-ers! How are you all doing? I've been seeing pictures scattered in various places about the web and know there are quite a lot of people taking part who haven't posted in the Tuesday Linky yet, so wanted to take the opportunity to say a big HELLO - it's lovely to have you knitting along! Please don't be shy this week - if you don't have a blog or use Instagram, you can leave a link to your Ravelry project page, photo host (eg Photobucket/ Flickr/ Picasa) or anywhere else we can see your pictures. I feel confident in saying that "Knitalong-ers" love nothing more than a nosey at everyone else's colours and progress - so let's see what you've got! This time I started the 'dropped YO' modification on the second section - this solved the "hump" I had with the other shawl, but as a result the first section looks quite tight and puckered. I'm not sure which is going to work out better in the end, but will let you know. I've been using a cheaper yarn in a solid shade for the main colour this time. The yarn itself (Jawoll Superwash Sock) is fine, but after knitting with devine semi-solid sock yarn from the Knitting Goddess on the first shawl, this feels much less exciting. Each row is exactly the same dark colour, it's boring predictable, and doesn't feel half as nice to knit. It'll be interesting to compare the two when this is finished and has been washed. It's the first time I've ever used such a dark solid 4ply and I'm not keen to repeat it, it's not terribly easy to see the stitches. Using 4 ply Noro for the third colour is much less daunting than the previous worsted weight which had so many thick sections, although I'm not sure if it'll make this a better-looking, more cohesive selection, or simply lack the character of the other. Again, we shall see! That's it from me for today. If you have stumbled on this post and would like information about the June Shawl Knitalong, and to see the previous posts you can find full details on the new KAL page as well as the last 50 photos participants have posted to the Instagram gallery. ooh I'm first, lets hope I did it right this week ! I'm loving the look so far Sarah, I'll be interested to see how the 'anti-bump' modification works out..
slightly ashamed to share this with the world, but you have to start somewhere I guess! Struggled with the M1l/r and forgot about the suggested mods to the pattern, so will keep going, now I've cracked the M1l/r. Although this photo doesn't show that I had here!! 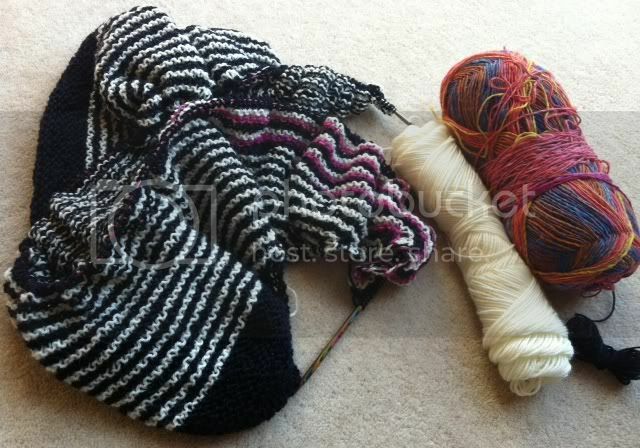 Oh, and I am super slow, might be more of an August KAL for me! Well, Louise, it's looking fine from your photo, I don't know what you were worried about :) M1L/R can be a pain in the bum to remember when it's an odd increase here and there - it's the reason I'm not bothering with it for this shawl (I'm doing KFB instead) but it can look lovely (especially when in a line) so I can see why designers like to use this type of increase. It's working out well actually and I'd been wondering what to do with that Noro for a while - although I think there is going to be LOTS left over! That pop of color will be great against the black and white. Thanks. It's actually midnight blue but you're right - it totally looks like black. Oh and feel better soon. Did you check for white spots? Bacteria is no joke. Loving the liquorice all sorts look of this one. Totally enjoyed seeing your first one and everyone elses creations so I took the plunge. Thanks for the inspiration I am enjoying the simplicity of this knit. Finally got around to sorting my ravelry project out! Hopefully the link will work. I'm really enjoying seeing everyone's progress and how different they all are. Can't wait to finish mine but the lace is taking time and I just wish I could have a few extra hours in the day.